Apple’s iOS platform is widely considered by musicians (at least the ones who care about such things) to be the superior mobile platform for music creation, because Android isn’t up to the task. Audiobus, which makes a really neat app for routing audio between music apps(so you can play keyboards in one app, add effects in another, and record the result in yet another, as one example), issued an email to all of its users warning them not to install iOS 7. Audiobus’ Michael Tyson then took to the forums to hint at what these problems might be, although he was barred by Apple’s NDA, agreeing with which was a requirement for testing iOS 7 early, from going into detail about these problems. But apparently, it’s not just an issue with Audiobus’ ability to route audio, but rather systemic issues that will affect some audio apps even when used on their own. If you enjoy making, DJing, producing, writing, or adding effects to music with an iPad, iPhone, or iPod Touch — or even rely on one for on-stage performance — Audiobus’ warning appears to be the real deal. As Dittmann mentions, this does not mean iOS 7 will have issues for people who don’t make music with iOS. Update: Audiobus developer Sebastian Dittmann responded with a bit more detail on what’s going on here. The short story: The most serious bug appears to happen when someone calls you, or another audio event happens, as you’re recording. Also, if you use an older iOS device for music creation, the upgrade will slow down your machine to the point that some audio apps won’t work as well. First of all: We’re trying to not to make a big story out of this, because we don’t want to hurt Apple or annoy them. But we felt like telling users about this because we feel responsible for iOS musicians who want the shiny new OS but don’t know how to downgrade and restore from a backup should they run into problems. There are a few issues with iOS 7 right now, first of all the lower general performance on older devices (which of course impacts the performance and usablity of audio apps as well). Then there are changes in the OS that require some apps to update the SDKs they’re using (Audiobus and some other third party SDKs). Many developers are really on top of things, but some apps might not have been updated yet. 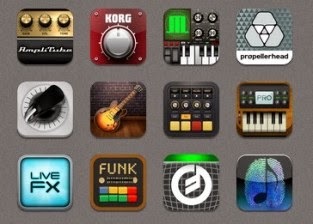 Having said that, we consider Audiobus to be ready for iOS 7 even or especially since now 300 apps are compatible with it. As with any new OS release there might be problems that we haven’t encountered yet. There have been changes in UI, CoreAudio, network and App Store related components. We’re still investigating some bugs regarding USB audio interfaces but we’re still in the process of nailing them down before we can be more specific. There’s another bug that we’re considering severe enough to actually make that statement earlier which appears whenever a phone call or another audio event interrupts an existing audio recording session. While Apple has given users an easy way to download older versions of apps just recently, there’s still no easy way to downgrade to older versions of the operating system. Until that happens, we’re felt obligated to issue a warning. I’m sure Apple is doing everything they can to fix bugs as fast as possible and I trust they’ll fix all the things I’ve mentioned above in the next point releases. Another update: Our friends at Create Digital Music agree: People who make music with iOS should not install iOS 7. Yet.